Mayor Warboss Ga'kuct has returned once more, with five letters hand picked from his multiple packhorse loads of fan-mail. This week he tries to re-assert his policies on the Elves as well as offer some good fishing tips. Enjoy! In honor of the Elves, Klug da Stu Makr, official chef to the Orcs, has decided to reveal one of his most closely guarded recipes in a rare tribute to the constantly rivaling race. The recipe? Why, it's one of the finest dishes on the Orcish table, Elf Ear Stew! Clompid Ilid- Remoob eerz, sabe peepirz. dyzkard da rezid. Gak wud uut clompin karn munstyrz dat bin libben arund da Orkie furt. Gak was out clompin red monsters that are living around the Orc fort. Den Klug blah dat demz phynd shiniez agh buuk wid ebil skrybbulz. Then Klug said he found some shiniez and a book of evil writing. Da Skrybbulz wud suu ebil dat da mosid bubhosh ebil skrybbul reedirz kud reed deze ebil skrybbulz.
" Kerrs! Tis I the Japa you contacted me on earth!" Said one of the faces from the wall. " You told me if I help you when you die, you'd help me be free of this place!" Kerrs jumped at this first sign of hope and replied, " Arrr, break me prison and I'll make sure we will be free of this torture!" Surprises awaited the attendees of tonight's annual meeting as many alliances were formed and pleads for peace were made. The meeting began as normal, with Cross spouting his hateful words toward the Orcs, and the Orcs being very kind and pleasant to the disgustingly dressed Paladin, but things soon changed very swiftly. A stranger appeared by the name of BloodLust. He was evidently an undead, a self proclaimed vampire, and had an announcement for Mayor Warboss Ga'kuct. "...we are allied with King Oberon and the Elves," stated BloodLust very calmly, "If not the Elves, then maybe us next for annihilation." Then as quickly as he appeared, he removed himself from the tower. The vampire was speaking in regard to the Elves fear of a possible Orc war, now that they are in the position to do so, with ownership of PaxLair City once more. (read more here). Ga'kuct continued the meeting, un-phased by the interruption; he was, however, unable to regain control as more disturbances followed. Mayor Warboss Ga'kuct has announced today that the Elves have nothing to fear from the Orcs. Mayor Warboss Ga'kuct has commented today on the statements made last week during his weekly Krak un Krydey article. An attempt to give people the ability to learn more about Mayor Warboss Ga'kuct and his plans and thoughts on PaxLair and the rest of the world. The Elves reacted harshly to Ga'kucts statement made regarding the question "When the Orcs do take over the realm, what race or class will you eliminate first?" To which Mayor Warboss Ga'kuct naturally replied the Elves, a race with a long standing rivalry against the Orcs. "Dis ib nub tru, Gak wud skrybbulid uut ogh kon-tex-id. Gak nub meen clompin lyk clompin clompin. Gak meen muur lyk wypid ough da faze ogh da uzg. Gak ib surri da latz ib tuu tuupid agh smellie tu gruk wud ib skrybbulid. agh Gak x-tendz kondeluniz tu demz clanz kus demz ib smellie agh tuupid ...kuz demz ib aphlikatid wid tuupid agh smellienezz"
Trinsic City is known for great things but, most know it well for its massive ports and city walls. Trinsic one of the major ports in the world sends out regular shipments of Yews Finest wines and ales. The Blue Light Tavern in PaxOku City uses this city to receive its stock for their bar. Over the past couple weeks shipments of ale have come with only a little ale or have not come at all. The Blue Light Tavern starting to run short on supply went to Zento city to see if they could avoid shipment problems from Trinsic. Zento unfortunately charges almost five times the price Trinsic does. Oberon [LoR], King of the Elves, and Lady Autumn [LoR] visited Governor Winfield today in his Mage Tower office in PaxLair City, Felucca. 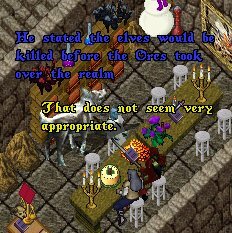 King Oberon was very concerned about Mayor Ga'kuct's recent Krak un Krydey comment about killing all Elves in the Realm. The Governor listened yet did not seem very concerned. Within the PaxLair Statehood, Dragons Watch has a high population of Elves, so there may be problems between that city and PaxLair City. 5)When the Orcs do take over the rest of the realm, what race or class will you eliminate first? -Ilidz ogh kurze. Demz skurge ogh da uzg. Wud demz poyntee eerz agh demz nubhosh neymz. Ib eberiteeng guz lyk da skeme, demz wylz bi clompid BEFUR da orkiez tak ober da uzg. Ga'kuct has sorted through his fanmail and has prepared five more questions to be answered. This week's questions delve into the mind of an Orc and tries to discover, what exactly is that smell coming from the sewers below PaxLair? During one of my rounds around PaxLair City, looking to find out what those dirty Paladins are up to, I stumbled upon a very curious meeting occurring outside of Cross MacLeodÃ¢â‚¬â„¢s supposed "Defense Fortress". Various aggressive creatures that are commonly seen in and around PaxLair City were leaving his home with what could only be described as 'bags full of money'. Upon further investigation I was able to hear what it was the creatures were discussing.